In December 1996, the two words, irrational exuberance, spoken by Alan Greenspan, then Chairman of the US Federal Reserve, became forever burned into financial market psyche. US equity markets had risen by 126% over the five preceding years, stretching equity market valuations in the process. As Robert Shiller, an economics professor at Yale University describes, Mr Greenspan was delivering a speech titled “The Challenge of Central Banking in a Democratic Society”. Fourteen pages into that speech he posed the rhetorical question, “But how do we know when irrational exuberance has unduly escalated asset values, which then become subject to unexpected and prolonged contractions”, adding later that “we as central bankers need not be concerned if a collapsing financial asset bubble does not threaten to impair the real economy”. His speech was being televised live and immediately after he made this famous statement the Japanese stock market fell sharply, closing 3% lower, followed by a 4% fall in London and a 2% fall at the open of US market trading. When are markets too expensive? The question he had posed encapsulated the underlying fear of investors who had witnessed a nine-year long bull market run. In the grip of the new dot-com world, had investors gotten carried away and lost sight of valuations? With the S&P 500 trading on a historical Price to Earnings (P/E) ratio of 21 times, were markets being irrationally exuberant? While his question captured the zeitgeist of the time, equity markets quickly shrugged off Mr Greenspan’s ruminations about asset price bubbles. 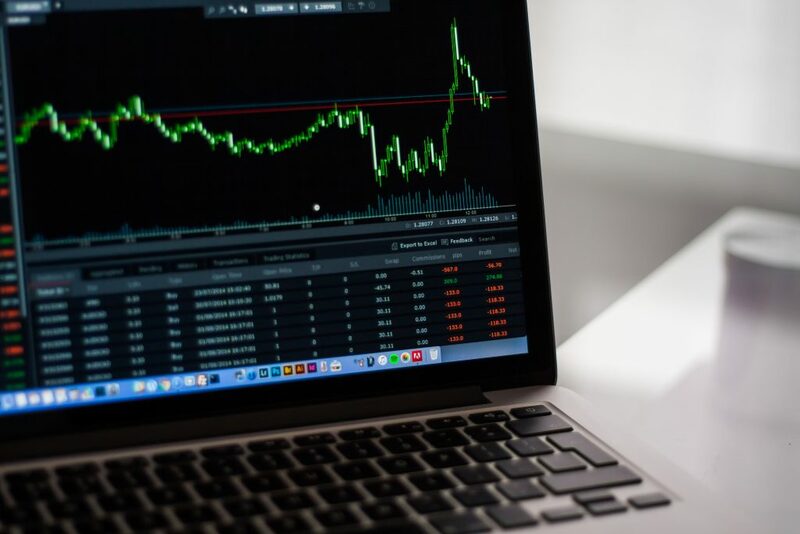 The US stock market rallied strongly for four more years, rising another 116% before it reached its dot-com boom peak in late 2000, after which it fell by 47% over the following two years in a high-profile market crash that followed. While the correction did ultimately validate Mr Greenspan’s musings about asset price bubbles, it also highlighted the folly of trying to pick market tops and bottoms. An investor who had bought the S&P 500 on the day of Mr Greenspan’s speech would still have been 13% onside at the bottom of the market crash in 2002. Twenty years on from Mr Greenspan’s famous warning about asset price bubbles, a similar fear hangs over equity market investors today. As equity markets around the world are near all-time highs, equity market valuations are once again looking elevated, leading many commentators to question the sustainability of current prices. One of the most commonly cited metrics used to uphold the idea that equity markets are overvalued is the Cyclically Adjusted Price to Earnings Ratio (CAPE), otherwise known as the Shiller P/E. The premise of CAPE is the idea that valuing a firm based on one year of earnings is a poor predictor of future returns, given how volatile annual earnings can be. Instead the CAPE draws on the work of value investors such as Benjamin Graham and David Dodd who argued for smoothing a firm’s earnings over five to ten years when trying to assess its intrinsic value. This valuation metric was popularised by Robert Shiller who formalised the valuation methodology with the construction of the CAPE, which uses ten years of inflation adjusted S&P 500 earnings as its denominator when calculating a P/E ratio for the market. Mr Shiller (and his associated index) rose to worldwide fame after the publication of his best-selling book “Irrational Exuberance” which argued that the stock market had become a bubble. Demonstrating a serendipity of market timing that had eluded Alan Greenspan, Mr Shiller’s book was published in March 2000, just months before the start of the market crash. The idea that the Shiller P/E would be a powerful tool for spotting asset price bubbles has stayed with many investors since, and Mr Shiller ultimately went on to share the Nobel prize in Economics in 2013 for his work on the analysis of asset prices. As the popular press likes to point out, using the Shiller P/E the S&P 500 today trades at a price to earnings ratio of 29.2, well above its long-run average of 16.7. Indeed, the notion that the CAPE is flashing a market warning signal has gotten considerable media attention lately, given it was ten years ago this month, May 2007, that the CAPE reached its peak of the last market cycle, being a ratio of 27.6. Within a few months of this high, the S&P 500 had suffered one its worst corrections in history. In a similar vein, most press articles like to further point out that – if we ignore the five-year period of the dot-com boom – the last time the US equity market traded at Shiller P/E ratio of over 29 was just before the market crash of 1929. Should we fear current market multiples? When presented like this, current market valuations using the Shiller P/E certainly provide much cause for concern. The bull market in US equities is now eight years old, making it the second longest bull market on record. It is certainly rational therefore to be wondering how much longer the good times can last. The problem with using market valuation tools like the Shiller P/E to try and spot asset price bubbles however, is that it is not remotely possible to condense all relevant market factors into one single valuation measure. Take for instance the notion that we should average company earnings over several years when trying to establish a reliable basis for pricing future earnings potential. Theoretically it makes much sense. In practice, a simple average of a randomly chosen number of years is open to large distortions. In the case of the current Shiller P/E ratio, the ratio is greatly inflated by the fact that ten-year trailing average earnings include the 2008/09 financial crisis. 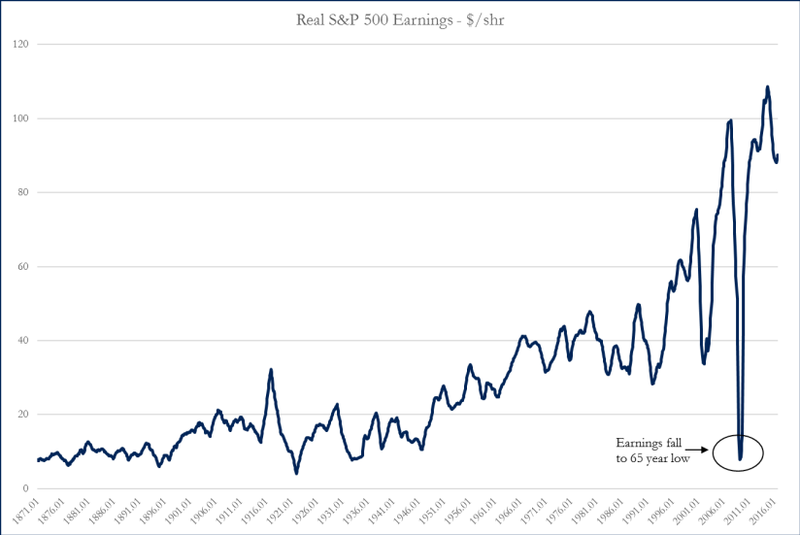 As the chart below shows, real S&P 500 earnings per share fell by 90% during this period, to a level not seen since the depression of the 1930s. This earnings crash however was a very short lived affair, within three year’s market earnings had largely recovered to their pre-crisis levels. If we were to thus calculate the Shiller P/E using a trailing five-year average, instead of a ten-year average, the resulting market multiple falls to 24.3, below the twenty-year average of 24.6 when we calculate the ratio this way. Another way of thinking about the signalling problem that the conventionally calculated Shiller P/E is currently showing is that, unless we have another 2008/09 earning crash in the next three years, market valuations are going to fall dramatically in 2020, simply because the 2008/09 earnings period is going to fall out of sample. Lastly, while many pundits like to compare the Shiller P/E ratio to its long-run average of 16.7, most fail to explain that the data Robert Shiller provides to calculate this metric stretches back to 1871. And while it is true to say that the long-run average market multiple calculated this way is well below current valuations, it is equally important to say that so are current interest rates. US benchmark interest rates as provided by Mr Shiller back to 1871 average 4.6%, twice the current benchmark rate of 2.3%, which is what the market uses to price assets from today. It is a well-established tenet of finance theory that low interest rate environments inflate asset prices (think of current bond prices, or perhaps Melbourne property prices), while high interest rate environments deflate asset prices. The Shiller P/E ratio reached its post WWII low of 6.6 in 1982, when US benchmark interest rates were 14%. That current market P/E multiples, Shiller or otherwise, look inflated against their long-term averages mainly just tells us that current interest rates are very low relative to history, any inference that it implies equity markets are dramatically overvalued is incorrect. None of this is of course to say that we might not be nearing a point of irrational exuberance (this author certainly does not pretend to have any greater insight than the herd). Rather that a selective focus on simple valuation metrics is inherently flawed. While identifying asset price bubbles is easy in hindsight, the one hard rule that modern finance theory has given us about them is that they are impossible to identify in advance. While the current handwringing in the press about market valuations may make for great headlines, it is doubtful it provides us with any real information on where markets go to from here.